Many modern couples planning their dream wedding feel stress due to a variety of factors, whether its concern over the escalating cost of venues and catering, or worrying whether or not the weather will be good on their special day. Opting for a destination wedding is one way couples can minimise these concerns as it allows them to combine the event with a perfect holiday, leaving the details to professional agencies like The Signature Weddings in Thailand. In recent decades "The Land of Smiles" has become famous as an eclectic and idyllic holiday destination thanks to its unique culture, stunning natural scenery and warm hospitality. An increasing number of couples are also choosing to say their vows in this idyllic Asian oasis, especially on islands like Phuket and Koh Samui, which not only boast some of the country's top world class luxury resorts, but also now offer a choice of stunning private villas that serve as an excellent location for couples to enjoy a stress free wedding and honeymoon. Another factor that makes Thai weddings so popular with couples from around the globe is the variety of settings that can form the backdrop to their big day. "When it comes to natural appeal, the kingdom literally has everything, from the magnificent mountains of northern Chiang Mai, to the tranquil beaches of Phuket and the urban chic of bustling Bangkok." Most wedding agencies in Thailand offer a choice of wedding venues to choose from, so you can find the ideal location for your big day. Furthermore, many venues also cater for larger weddings of up to 150 guests or small and intimate gatherings, depending on the preference of the bride and groom. Luxurious villas can also be adapted for other events including birthdays, anniversaries and corporate events. In particular, wedding ceremonies conducted in the luxurious surroundings of a private villa guarantee a feeling of exclusivity, and add to the feeling of a truly personalised and customised celebration. 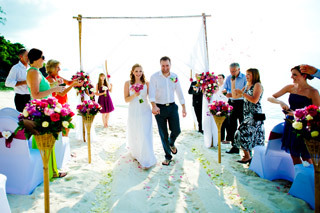 Western ceremonies in Thailand can be as formal or casual as desired. In a traditional Thai wedding, the bride and groom are married by orange robed Buddhist monks and usually, some parts of the wedding day will only be attended by close friends and family of the couple. The timing of a Buddhist wedding service is carefully chosen as an auspicious blessing for the newly married couple. It is for this reason that ceremonies may begin at seemingly odd times, like 9:09 am (nine being a lucky number in Thailand). Weddings in private villas generally include a reception on-site with staff on hand to serve delicious meals and guests free to enjoy the pool or beach as day turns into night. 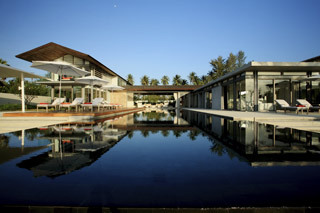 Special additions such as firework displays or the release of traditional Thai lanterns into the sky add to the unique appeal. "Private villas are the ultimate choice for a bespoke wedding celebration"
Enjoy a delectable buffet of traditional Thai dishes, in addition to a selection of Western cuisine if you are in the mood for something with a little less spice. To create a more personal and intimate atmosphere at their wedding, many guests choose to have a professional guitarist serenade guests throughout the wedding if they want something more unique than the usual wedding DJ can offer. Add a further Thai touch to your wedding by opting for the native Thai blooms of orchids and lotus flowers to your bridal bouquet. The best Thai wedding planning agencies also offer the bride and groom assistance in handling the legal side of their wedding. Despite this, every couple should still finalise the compulsory requirements in both Thailand and their native country prior to the wedding ceremony itself. The Signature Weddings draws on its considerable experience in planning customised wedding celebrations, working hand in hand with couples to create their special day to guarantee an exceptional event in one of the Southeast Asia region's most appealing, luxurious and naturally beautiful location.